IN the popular books of to-day, dealing with the origin of religion, we find it stated that they originated from fear. It is described how our ancestors, while in a savage state, and being unacquainted with the revelations made by modern science, saw the lightning flash, and heard the noise of thunder and watched other natural phenomena, whose origin they could not explain, and how they came to the logical conclusion that such things must be produced by some extra cosmic supernatural and intellectual power, which might some day take a notion to destroy their possessions; and which must, therefore, be flattered and propitiated so that it might be kept in a good humour. Such a scientific explanation of the origin of religion and the belief in God may satisfy the speculating brain of the rationalist and thinker, who, living entirely in the moonshine of his own imagination has no perception for the light of that knowledge which belongs to the spirit of man; but such a theory will not satisfy the heart in which there is still a spark of the divine life, and which, therefore, feels the presence of a universal and higher power that is not a product of nature, but superior to her. A religion having such a merely logical origin would be truly the religion of the devil, because it would be thoroughly false. It would be merely a system teaching how God may be cheated and eternal justice be made to come to naught. True religion has nothing to do with fear nor with logical speculation, and its true origin rests in the fundamental relation which the human soul bears to the divine origin of the spiritual power by which she is inhabited. It is the divine spirit in man itself, recognising and through the instrumentality of man the presence of the universal spirit in nature. This divine power is truly "occult," because it cannot be perceived by any external means, neither can its existence be logically proved to those who are not capable to feel it; it will for ever remain a mystery to the "Adam" of earth; because it is divine and can therefore be intellectually known to man only when he has entered into a state of divinity. Nevertheless, it is a quality inherent in the nature of man that he wishes to know intellectually that whose presence he intuitively feels, and there have, therefore, at all times been men curious to know the nature of God, and attempted to break by their intellectual efforts a hole through the veil that covers the sanctuary of the great mystery, so that they may peep through it, and gratify their curiosity. 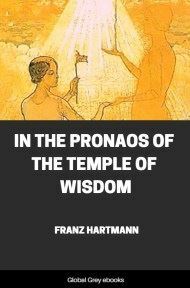 From the vagaries of such speculators, visionaries and pseudo-philosophers has originated a false system of theology, mysticism, and superstition, which is even to-day often regarded as being Occultism and Theosophy. The soul of man stands in the same relation to that spiritual power that fills the universe, as the flowers of the field to the light of the terrestrial sun. A plant deprived of life will sicken and die, and a soul in which the spirit of holiness does not exist will become degraded lower than the soul of the animals; because animals are not given to arguing; they act according to the laws of their nature, while the possession of an intellect enables man to act unnaturally, and in opposition to divine law. But there have also been other men, who, by remaining natural and obedient to divine law, have grown into a state of spirituality superior to the merely intellectual state, and in the course of their interior enfoldment, their inner senses have become opened, so that they could not only intuitively feel, but also spiritually perceive this light of the spirit. Such men are the true Mystics, Rosicrucians, and Adepts, and with them the historian and antiquarian has nothing to do; because they are beyond his reach of investigation. 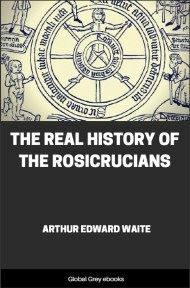 A "History of Rosicrucians" could, at best, be a history of certain persons who "were supposed to have been spiritually enlightened." It would have to remain for ever uncertain whether a person mentioned in such a "history" had really been a Rosicrucian or not; because that which constitutes a man a saint and a sage does not belong to this earth and cannot be examined by mortal men; it is that part of man of which the Bible speaks when it is written, "We live upon the earth; but our soul is in heaven." External investigation can only deal with external things; that whose existence depends on a form can deal only with forms; but all forms are merely fictitious to him who recognises by the power of his spiritual perception the truth which the form represents. The whole of nature is an expression of truth; but there are few who can realize the truth expressed in nature. We are all more or less caricatured images of the truth which we are originally intended to represent. As long as we have ourselves merely a fictitious existence, owing to the non-recognition of the truth within our own selves, we merely know the caricature which we represent, but not our true, real self.